Official Google Blog: Happy 1st birthday, Google Wave! Happy 1st birthday, Google Wave! for communication and collaboration to a crowd of developers. In a guest article on the Huffington Post last week, Lars described innovation and working on Google Wave as a rollercoaster—and this year has certainly been a fascinating ride. For the past year, I've had the pleasure and the challenge of explaining why this new technology is useful. Unlike some other products that I have also been lucky enough to work on, Wave is not a more advanced approach to a known application like webmail or the browser. It's actually a new category, which can be kind of hard to wrap your head around. I work in Wave every day, and we have identified a number of clear use cases for getting things done in groups at businesses and at schools. But people also ask me how I use Wave outside of work to understand how they should start using it themselves. As it turns out, the ways I use Wave aren't revolutionary or groundbreaking—I communicate about everyday things, but it is these incredibly ordinary and important communications that are transformed in unexpected ways when you use Wave. I wave with my family—with my mom, who is across the country, and with my sister who is a graduate student. We're all on different schedules and very rarely all online at the same time. 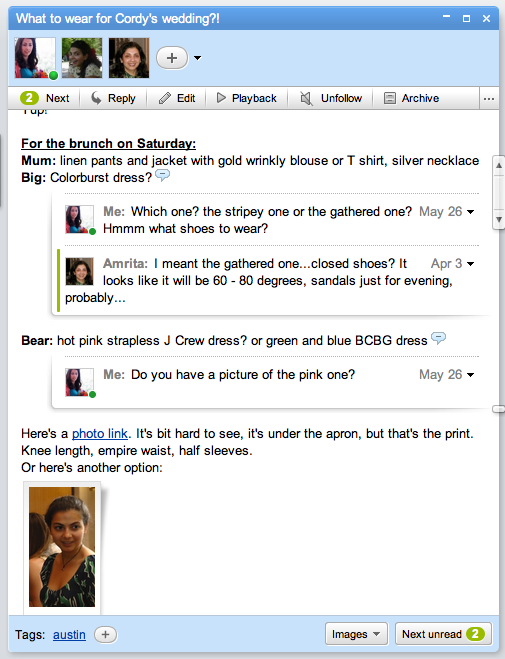 In one wave, we decided what to wear for a friend's wedding—adding suggestions for each other with links and pictures, updating the wave as we had side conversations and made decisions. My mom and I chatted about my dress choice when we were both online, and then my sister was easily able to catch up later, adding her ideas. It kept all three of us up to speed in one place, rather than having several phone conversations, emails and chats. Sharing these small personal projects in a wave removes the little bits of friction to make the discussions more dynamic and productive. From talking to other people who use Google Wave, I know I'm not alone. I've been struck by the really personal nature of communicating and working together in Wave, and the emotional response people have to their first uniquely wavey experience, what we call the "Wave a-ha moment." For many people it's the live typing that does it; for others it's the first time they create an in-line reply, embed a YouTube video or edit someone else's text. You really do have to try it to believe it, though—so if you checked out Google Wave six months ago and found yourself at a bit of a loss, take another look. The product is much faster and more stable and we have templates and tutorials to help you get started. Next time you find yourself taking notes while you are on the phone, do it in a wave and add your colleagues, or pull a couple friends or family members onto a wave for a small project... like going to the movies. So head to wave.google.com and sign in. You can get more updates on our blog and even share your stories (ordinary or otherwise) with wave.stories@googlewave.com. Today, it's been a full year since the Wave team first got on stage at the Moscone Center and demoed a new vision for communication and collaboration to a crowd of developers. In a guest article on the Huffington Post last week, Lars described innovation and working on Google Wave as a rollercoaster—and this year has certainly been a fascinating ride. For the past year, I've had the pleasure and the challenge of explaining why this new technology is useful. Unlike some other products that I have also been lucky enough to work on, Wave is not a more advanced approach to a known application like webmail or the browser. It's actually a new category, which can be kind of hard to wrap your head around.